Very busy, if you're into 'Where's Wally', you might find him in here. Tireless pursuer of music enlightenment finally shares his own sounds with the world that’s there for the taking. Even those who know the story Arlo Hennings told in his memoir "Guitarlo" – a tale of a man driven out from the States to find a different state of mind in Indonesia yet never lose the love for a tune and the respect of many a famous artist – could hardly imagine the melodies he’s able to shape, but in case anyone doubted the business veteran’s individual level of musicianship, “Jawa Warrior” will blow skepticism to pieces. Still, exotic and avant-garde in equal measure, and simultaneously welcoming with a promise of adventure, if not heady trip, this album doesn’t have a lot of belligerence in its many grooves, with only the title track packing a sweet menace in its dynamic ripple and wolf’s howls which run throughout the record to stitch natural sounds to synthesized reverie in a concept way. 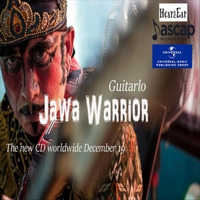 From the metal clang and otherworldly squeal of “Sawang-Sinawang” whose soundscape serves as a sinister intro to delights that will follow, to “Kampung Puisi” – a playground for the elite Indonesian musicians, such as Reza Ryan and Adi Widjaya, informing Arlo’s music with top-notch jazz-rocking – there are tension and release in the seven numbers’ unpredictable meander. Jason Bonham’s thunderous drums on the rain-soaked “Hujan Chant” opens dramatic dimension to Hennings’ sonic paths, while Kenny G’s sax cameo on the piano-laden “Sore Kopi” stresses Arlo’s pop-fusion leanings and the intensity of his six-string filigree – integral parts of his previously verbal-only yarn combining flavors from West and East. There’s also an alluring buzz in “Mt. Agung” where transparent sheets of guitar fabric are suspended over the chirps of invisible insects, which glow aurally, to lead into the most exciting “Borneo Jungle” – a delicately insistent melange of elegiac electronica and cello bound by an elastic bass line. The listener won’t have to fight with “Jawa Warrior”: it’s an amazing journey rather than a challenging battles – yet the thrill is the same.